Microcopy Number 276 of the National Archives Microfilm Publications contains 10 rolls of microfilm which include the compiled service records of volunteer Union soldiers belonging to the First Regiment of Alabama Cavalry. This regiment is the only organization of Union troops from Alabama for which the National Archives has separate compiled service records, except those organizations redesignated as US Colored Troops. These men not only fought in the Civil War, but fought for what they believed. Many of them were of Scotch-Irish descent and stated their forefathers came to this country looking for a place to worship as they pleased and this country embraced them and allowed them to do so. They also stated their grandfathers fought too hard and suffered too much fighting for this country in the Revolutionary War and they certainly couldn't fight against the same country they fought, suffered and in some instances, died for. They stated they could not fire on "Old Glory", the Flag of their forefathers. Many of the men in the First Alabama Cavalry, US Volunteers lived in Northwest Alabama, Georgia, Mississippi South Carolina and Tennessee. However, living in the South, they were unable to speak out against the war. Many of these men had to travel long distances to avoid being captured by Confederate soldiers and branded as traitors to join the Union Army. 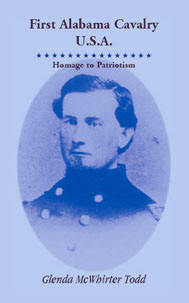 The text includes: reports from the field; a chapter on General William Tecumseh Sherman; some National Cemeteries and places of death of the First Alabama Cavalry Union Soldiers; the combat diary of Sgt. Maj. Francis Wayland Dunn; camp-fire chats between the men and a roster of soldiers in the regiment. The roster is alphabetized and includes the following information on the soldiers: name, age, residence, family information, and what happened to them during the war, along with biographical information, photographs of soldiers and many other interesting facts. A full name index is also included. As unusual as it was at the time, 16 "colored" soldiers served in this regiment and some in jobs other than undercooks as most of them did. Some served as regimental teamsters and wagon masters. The author is currently working to mark the graves of soldiers who have been in their unknown, and unmarked resting places, by ordering pension records to ascertain where they are buried. Many of them have been in unmarked graves since the Civil War. Several tombstones have already been ordered and erected. (1999), 2006, 5½x8½, paper, index, 442 pp. $36.50 T1198 ISBN: 0788411985 "